When we first moved into our own house, I always thought that the first recipe I was going to try out in the kitchen is going to be a perfectly oven-roasted chicken. Somehow, it seemed to me that it is only right (and simple enough) that a oven-roasted chicken is to be the first dish coming out of the newly bought oven and right onto the dinner table for our first Christmas dinner in our own home. Pity, this did not happen in our case. 2 years had passed and it finally stuck me the other day that I have not tried roasting any poultry using the oven yet! How can I let that be the case? 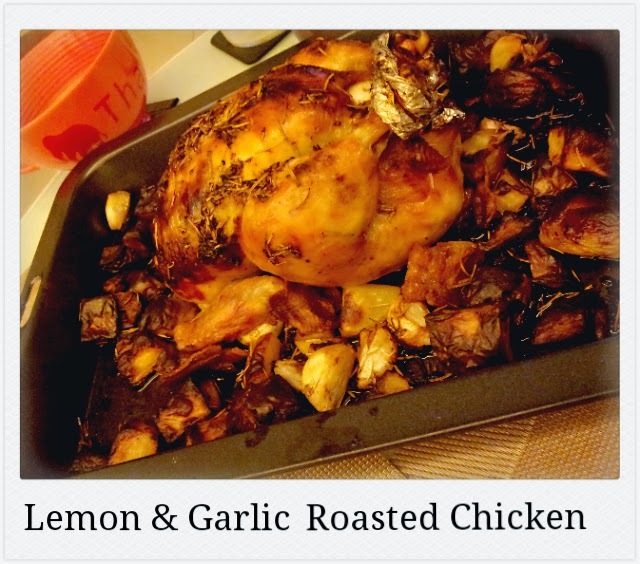 Finally, a couple of Sundays ago, I decided to give the 'Roast Chicken with Lemon & Herbs' recipe a try. As usual, I made some small changes to the original recipe and the chicken turned out really well! Personally, I feel that this dish is great for beginner cooks like myself, with minimal ingredients and attention required. 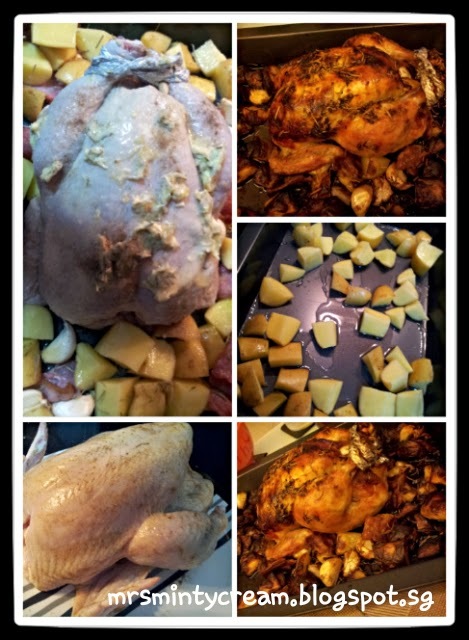 This time round, I even tried to cook the roasted potatoes together with the chicken (and some bacon as well) but it turned out that the potatoes were kind of overly done. Though the potatoes tasted great but I wouldn't advise anyone eating too much of them due to the burned skin. Not that good for health, you see? In fact, the next time I try this recipe, I would probably cook the roasted potatoes and vegetables separately as there will be plenty of time to do so while waiting for the chicken to cook in the oven. Most importantly, add plenty of lemon, garlic and rosemary! They impart a light and soft scent to the meat. They are such an excellent combination! 1. Preheat oven to 200C and drizzle roasting dish with some olive oil. Set the roasting dish aside for later use. 2. Rinse the chicken inside and out, and pat dry it with kitchen towels. Season the chicken with salt and pepper (including the cavity) and set aside on a large plate for later use. 3. Wash, dried and cut the potatoes into large chunks, depending on size of potatoes (about 8 to 12 pieces per potatoes) and place them in the roasting dish together with the garlic cloves and pieces of bacon. You may also add in sliced onions or vegetables if you prefer. 4. Add the chopped rosemary to the roasting dish as well and season them with salt, pepper and olive oil. Toss everything together in the roasting dish to ensure the seasoning is well spread out. 5. In a small bowl, add the finely chopped rosemary to the soft butter. 6. Using a grater, grate 2 cloves of garlic and add the grated garlic to the butter mixture in Step (5). Also add in the zest of 1 lemon. Season this mixture with salt and pepper. Using a spoon, make sure that this mixture is well mixed together. 7. Rub 3/4 of the butter mixture under the skin of the chicken, between the breast and the skin of the chicken. 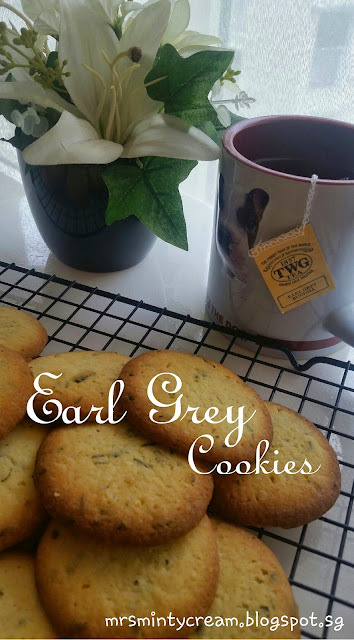 Massage well to ensure that the butter mixture is evenly spread out. Rub the remaining 1/4 of the butter mixture all over the chicken. Drizzle the lemon juice of 1 lemon over the chicken. 8. Cut the remaining lemon and garlic into half and stuff them inside the cavity of the chicken. Also add in some rosemary inside the cavity of the chicken and tie the legs together either using kitchen string or aluminium foil. 9. Place the chicken in the roasting dish, making sure that the chicken wings are tucked under the chicken itself. Sprinkle some salt and pepper evenly over the top of the chicken. 10. Bake for 45 minutes, baste and cook for another 15 minutes, or until the juice of the chicken comes out clear after cutting a slit at the chicken thigh. 11. Remove the chicken from the oven and cover it with aluminium foil for 15 minutes before carving. (1) Take chicken out of fridge at least 1 hour before roasting it. (2) Use fresh chicken instead of frozen chicken. (3) If roasting potatoes together with the chicken, check on the potatoes after 30 to 45 minutes. Once the potatoes are done (dark-coloured), remove them from the roasting dish before continuing to roast the chicken. This is to ensure that the potatoes will not be burnt. Alternatively, cook roasted potatoes / vegetables separately.